Ahoj, Ciao, Czesc, Hallo, Hello, Hoi, Hola, Kia Ora, Ola, Privet, Salut and welcome in Bratislava! Discover a contemporary apartment in the heart of the historic part of Slovakian capital city of Bratislava. Located in the Old Town center, this apartment is 6 minutes from the Bratislava train station, 15 minutes from Bratislava (BTS) Airport and only 45 minutes from Vienna (VIE) International Airport. The apartment does not share space with any other guests. 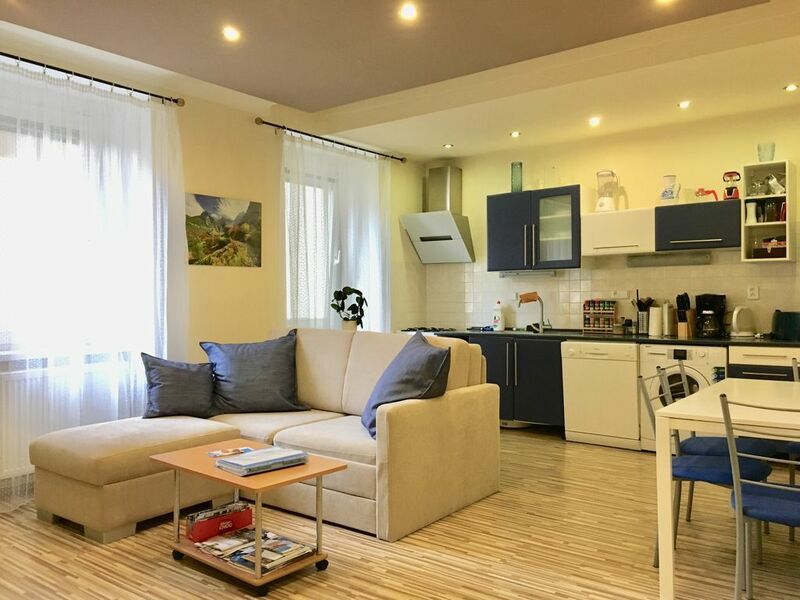 Apartment Blue Bratislava at Heydukova Street is a large clean two-room apartment of 60m2 (645 square feet), which sleeps up to five persons and features a separate 1 bedroom and 1 living room connected to the kitchen and dinette. The bedroom has one king size bed + twin bed for 3 guests and the living room has a large very comfortable sofa for 2 guests. The apartment has also available baby crib/cot. Recently remodeled, the apartment is situated on the ground floor of a quiet street where all windows oversee an inner courtyard. Each window has blinds and shutters. In summer season, each window has an insect screen. This apartment includes a fully equipped kitchen, bathroom with a shower, high speed internet, cable 46 inch smart TV (120+ channels-Austrian,Czech, English, French, German, Hungarian, Polish, Russian, Slovak), Roku box if you have your Netflix or e.g Amazon account, Blueray DVD player with many awarded movies, iron, washer, dryer and a lot more. Free High speed WIFI+ a computer (- available only on request during the booking process). Apartment's walls are very thick and it's ground floor is keeping it nice, naturally cool during the summer therefore doesn't need normally A/C. For the extremely hot days we have a high quality A/C system to cool the fresh air down - depending on to what temperature are our guests used to. We can welcome you in Czech, English, German, Polish, Russian, Slovak and Spanish. All tourist destinations of Old Town are within walking distance, as well as restaurants, coffee shops, bars & multiple supermarkets. For rainy days, there are also free umbrellas available for guests. FREE high speed internet included (encrypted Wi-Fi connection in addition to a wired LAN connection). Download speed: 250 Mb/s. Traveling owner works for global software security company. Please NO smoking and NO pets in the apartment. Earliest check-in time: 15:00 (3 PM), latest 1AM. Late check in after 9.00PM is 20 Eur fee, after 11.00PM is 30 Eur fee. Latest check-out time: 11.00 (11.00 AM). We always try to make it flexible and meet your needs - based on our calendar and other guests. Please request in your inquiry or ASAP! Cleaning : We can run robotic vacuum for you remotely! For longer stays this includes cleaning every 14 days. Dining: Breakfast is not included. Fully equipped kitchen is available. There are many restaurant and cafes in the nearby area. Children stay for free (if separate bed is not required). Children from 4 to 10 have 50% discount. Children up to 14 years have 25% discount. Discounts do not apply for sport events (major football matches, ice hokey matches,..), culture activities and concerts for already booked stay. Apply for the discount before the booking is done-send us a message please. Baby Crib available 15 Eur per stay. Walking distance to all touristic spots, Main Square, St. Michael's Gate, St. Martin Cathedral, Bratislava Castle, river Danube, traditional Slovak restaurants, supermarkets, pubs & bars. There are multiple bus stops, trolleybus and tram stops near by. Public street parking (limited) - costs 9.6 EUR per whole day (0.6Eur/30 minutes) during the week (FREE during weekends and free Monday-Friday between 4 PM and 8 AM). There are also multiple guarded parking places available 100- 400 meters from building. Vienna Swechat Airport(Austria) - 45 minutes by car. Very close to multiple supermarkets, from 200m to 400m (2-4 minutes walk). Castle - 1,5 km (20 min). There is a fee of 20 Eur for a late check in after 9 PM, after 11 PM is 30 Eur fee, latest check-in is 1AM. • In order to provide a clean, safe and healthy environment SMOKING, VAPING and fireworks are strictly PROHIBITED on the whole property/building/apartment. VIOLATION will incur 500,-EUR cleaning FEE. - If you need to smoke please smoke outside of the building on the street. • Loud noise or activities that will be irritating to others will not be permitted. No stag/hen parties. • No animals and pets of any kind are allowed in the apartment. We want to make sure guests with related allergies have a comfortable stay. • The premises shall be used for residential vacation rental purposes only. Special events such as parties, receptions, etc. shall not be allowed without the express written consent of the Owner. You may not use the property for filmmaking, photo shoots or unlawful, improper, or offensive use. Over-crowding or misrepresentation is grounds for immediate eviction without refund. This unit cannot be sublet or assigned to others. • NEVER leave the apartment without taking out the keys from the inside lock otherwise its not possible to use keys from out side. Lock the door using the key from outside. Locksmiths can charge 100€ to open the door, and also needs to drill it... Door locks in Slovakia are completely different than many other world regions. • Earliest CHECK-IN time 3PM(flexible depending on previous guests) and latest CHECK-OUT time is 11.00AM. - We always try to adjust it for you if it's possible, we need to know about your check in/out time enough time before and then check to be sure it will not be in a conflict with our other guests checking in or out. Please always request ASAP. The World is a book, and those who do not travel read only a page. - St. Augustine We love to travel and we try to travel around the globe each time there is a chance. That helped us the most to know what should the apartment Blue offer to feel there like at home! We always try to do our best to make your stay nice, if you are happy then we are happy also ! Central Old Town Bratislava location which is still easy to access with all kind of transportation, just on the edge of only pedestrians zone, you can't really get closer to the main square and at the same time have all the important spots around you. Shopping is easy, everything within 5 minutes walk. Each side of the building is close to various transportation nods so it is easy to get there/from the airport, train station, bus station. It is also easy to get off the taxi right in front of the building. The apartment Blue is in the heart of Old Town and at the same time it is super quiet you would not believe, just see the reviews of our past guests. The apartment is facing the courtyard and the walls are thick, 100 years old, remember a lot from the history ! Clear instructions, care, respect and comfortable stay. Same as what we expect when we travel. It has a great location in the old town, walking distance within few minutes to almost all tourist attractions, restaurants, cafes, night life, green park etc. We have for our guests information about city and maps, if there is something we dont know - then only 4 minutes walk from the apartment is a tourist information office where they give you for free all kind of other information, maps, brochures or help you with ticket discounts. What people probably like the most is the location vs how quiet it is. You would think you are out of town because its so quiet apartment. Easy to be busy during the day/night and then sleep very well. Windows have outside shutters/blinds which make the place completely dark any time you wish, this is usually very popular for people with jet lag and they can take a good short nap any time. Very nice bathroom with a fan. See pictures. Soap/Shampoo + towels and toilet paper provided. centrally located, surrounded by public transportation nods, walkable, restaurants, cafes, accessible with taxi, 1 block from pedestrian zone so still possible to access from the street directly. Central heating, adjustable with thermostat. We have it all, no need to bring your own, all provided, bed sheets, pillows, pillow cases. 1 private washer in the apartment, not shared. + also a drying rack , which is still the common way of drying clothes in this part of world, you still rarely see an electric clothes dryer. Bath and kitchen towels provided. not needed/used, building does not have elevator, its only 12 steps/stairs to get to the apartment. Very spacious living room with a big 46 inch Smart TV, blueray&DVD player and library of awarded DVD movies in english, some are also in spanish and french and various other languages. gas, simple to use and adjust the heat any time. electric oven, great for baking or making pizza ! Standard and also an italian espresso coffee maker. Salt, black pepper, all kind of spices, sugar provided. Paper Towels provided. Most likely everything what you will need. If something is missing, let us know and we will add it. Fully equipped kitchen with fridge, freezer, microwave oven, gas oven, kettle, blender, toaster, dishwasher, washing machine. Everything what you need for cooking including the spices. Living room connected to the kitchen and dinette. Child's highchair on request during the reservation. large and new 46 inch smart TV+ region free blue ray&DVD player in the living room + another region free DVD player with TV in the bedroom. + Radio, Audio CD and MP3 CD with Bluetooth. Blueray+DVD player is region free, you should be able to play DVDs from any world region. all kind of genres, also for kids. Most are english and also some are in spanish, slovak, czech, russian, french and few more languages. Free local Guides/Maps provided which you can keep, 4 minutes from apartment is also tourist information center. Each window has screens against insect during the summer. Apartment has also umbrellas available for guests for rainy days. I rented the apartment based on previous reviews. I was not disappointed. In fact the apartment and Josef exceeded my expectations. Josef is the ideal Landlord. He met me upon arrival and saw me off in a taxi upon departure. In between he ensured that I was aware/informed about all pertaining to the apartment and the locality. The apartment is very spacious, very clean and well decorated. It has all that you'd need. Plus it is located in the 'old' historical part of town, so shops, and restaurants are within walking distance. If I have the pleasure of visiting Bratislava again I would like to stay in the same apartment. We thoroughly enjoyed our stay in this very comfortable & well-equipped apartment near the old town section of Bratislava. Everything was clean & well-considered for guests' convenience & comfort. We travel 6 months a year & stay at a lot of different places, and this host was one of the best we've worked with. He was extremely responsive with communication prior to arrival & throughout our stay. He has added many special touches: a broad selection of DVDs, meticulous instructions for using appliances & equipment, a comprehensive guest services & tourist information guide, to name a few. Bed & linens were excellent, the kitchen fully equipped & also stocked with extras like a spice rack, olive oil, balsamic vinegar, etc. Location was also great - about a 15 minutes' walk from the Danube & old town, less than that from a shopping mall & supermarkets. The neighborhood is quiet but also convenient to lots of great restaurants of just about any preferred cuisine. Wifi & all other technology (TV, DVD player, etc.) were all reliable. Having a washing machine available is always helpful, but this apartment had a dryer, too - unusual in Europe. We can give this flat & host our highest ratings. We have stayed in many apartments while traveling and both my wife and I would have to rate this apartment hosted by Jozef as the best. It had everything you would need or want for a comfortable stay. A fully equipped kitchen, a large lounge area, a big bedroom and a great shower. We didn’t want to leave! Plenty of towels, up to date appliances and only a short walk to the supermarkets, old town and transport made this an ideal place to stay. It was so quite and dark with the shutters down we had the best sleep of our holiday so far. Jozef was very helpful with everything and was a delight to meet. I highly recommend Apartment Blue for a stay in Bratislava. This is an awesome apartment in a great location. Rent this apartment you will not be disappointed. Modern appliances, air conditioning, kitchen was stocked, apartment was spotless and videos that explain how to work everything. Jozef was an awesome host. Attentive to any questions and he really added to our enjoyment of this apartment and Bratislava. Jozef made arrangements for us to get to the train station and it was one less thing we had to worry about. My wife and I travelled with our adult son and his fiance and we all agreed that this apartment was the best of the four VRBO sites we rented on this trip. I highly recommend Jozef's apartment and I would definitely stay here again on a future trip. Comfortable apartment in an excellent location. We found the apartment well-located for sightseeing in the Old Town and going to good restaurants. We especially appreciated the host's responsiveness and attention to detail. The notebook for guests was the most comprehensive we have encountered, containing all the information one needs for enjoying the spacious apartment and the city. Free Maps/Guides. Also, there is a Tourist information center 4 minutes walk from the apartment. We have for you in the apartment also a whole list of recommendations for attractions, points of interests, good restaurants, cafes & bars. Discounts and additional information: - to get a discount please contact us before you do the reservation and finish the booking after we send you the offer with the discount applied. Children stay for free (if separate bed is not required). Children from 4 to 10 have 50% discount. Children up to 14 years have 25% discount. Discounts do not apply for sport events (major football matches, ice hokey matches,..), culture activities and concerts. Late check-in after 10PM an additional fee of 15 Eur.